any other information you feel relevant. Last edited by Carpe Diem; 05-04-2016 at 09:29 PM.. This has never happened to me but I will try to report what I can when it happens to others. It was happening tonight in MTMU-Kamek. I started noticing hiccups when it would happen. There was one at approximately 9:45pm CST where 4 players got disconnected. Phrozen and Vugluskr (not sure about that spelling) plus two others I forget. Not sure if it helps narrow down the time but my screen shot that I took shortly after shows 5:58 in the third round. I would say I took that within 10-15 seconds. Maybe the MOTD could be changed to encourage players to come to the forums and report the disconnects. The current MOTD is out of date anyways. I would say that Wormbo's crash fix is working very well. Once around 2220 EST, again 3-4 minutes after that. And then again at 2245 EST, as Binger mentioned. I believe I'm a first time caller on these forums. Happened tonight while playing a version of Junkyard around 7PM CST. Several others were dropping as well. I'll send 5 Tubman's via PayPal your way to help with moving to another server if needed. If this can't be changed, I'll have to spend more time with my wife and she'll get the Tubman's. Around 9:10 central time 5/7/2016 I was kicked off. I notice most of the time I'm disconnected, it appears that about 8 people are disconnected, it isn't usually just me. From what I can see, it appears it might be related to the team balancer mutator. If it helps any, these issues were happening before the mutator was loaded. I am not saying it's not at fault or contributing... I don't know. I can say it occurred before though..
Don't shoot the messenger. If it looks like a regular disconnect to the server, an in-game balancer can't see anything else. It says "Connection timed out after 20.000000 seconds (20.030770)" for everyone, so something must have interrupted network traffic at a point all those players share, which can only be the server itself and network equipment immediately connected to it. 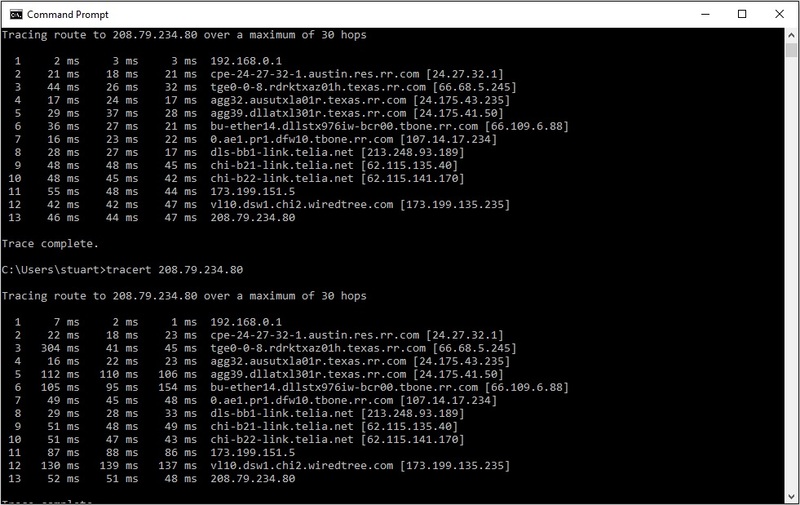 Everyone getting disconnected should probably do an immediate TraceRoute to the server, either via WinMTR or cmd -> tracert <serverip>, to see the number of shared hops from the players. Unless the game server process itself stops for 20 seconds, which seems a bit unlikely, it's probably a weird network outage thingy. I got disconnected 5/10/2016 9:57pm central time. Here's a tracert right after I was disconnected (and also showing is a tracert from a day or two ago at a random time... I did that earlier so I'd be ready to do it after I got disconnected). Last night around 11:00pm EST, on the new MagicIsle, a lot of players (more than half) were getting disconnected. It did not happen to me, but several people left and came back. Bo_Fox stated he got disconnected 3 times. I urged everyone to go to the forums and report it, looks like SmallBerries is the only one who did (and me). Purely anecdotal, but it does seem to happen a lot on this new version of MagicIsle. BTW, I rarely experience a disconnect from this server, even when just about everyone else is getting booted. Not sure why it doesn't happen to me, maybe the server knows better than to mess with Enyo. Does seem to happen a lot to particular players... Bo_Fox and Xexx come to mind. Seems like those guys get disconnected at least once every time I play with them. I get disconnected frequently on MagicIsle and Dria. These are the two maps that I see the most "mass-disconnects" on. I'll try to keep a log. Those two maps are also voted in quite often and have matches that can last up to an hour. True, those maps do last a while, but the mass disconnect on MagicIsle the other night happened very early in the game, I'd say within first 10 minutes. I am not sure there is a map specific pattern. Though I have been disconnect on MI I would say it is no more than "normal." It seems to be more day/time based. Peak hours it happens more. This has been going on a long time, sadly. It goes through phases for sure... maybe moods. What I meant was that at any given time, there is an above average probability that one of those two maps is being played on the server because they get voted in every cool-down cycle and last longer than other maps. That's why when a mass disconnect occurs due to circumstances that have nothing to do with the server itself, it would appear to happen more on those two maps than any others. got disconnected on tank me up randomizer May 14 16:11 and 16:16. Part of a mass-disconnect. And again at 9:54. Smoker also got disconnected at 9:51, and he's also in Texas. FWIW, this was in the final round of a long Minus battle--the map had been playing for some time. Disconnected 8:34pm central 5/16/2016 in Minus. In the first round, map only had been playing for about 5 minutes. Mino on the bridge; who could it be, i wonder.